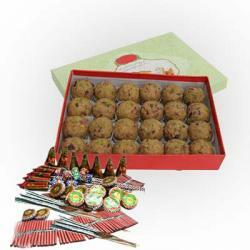 Product Consist : 16 Pcs Ferrero Rocher chocolate Box with Assorted Fire crackers (Worth Rs.300/-) (Note: Types of Fire Cracker are depends upon their availability no specific choice). Boom the darkness with the lights of crackers and light up the lives with the diya of your loved one. 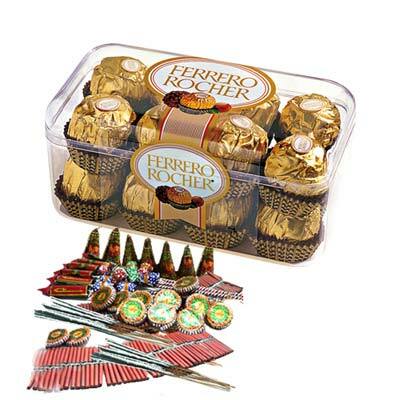 On the pious occasion of diwali celebrate the occasion with the sweetness of Ferrero Rocher chocolate and the crackers. 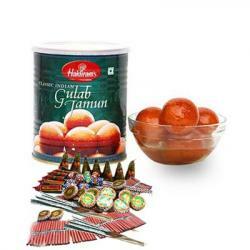 The crispy and crunch taste of chocolate will blend into the lives of your loved one and the boom sound and the light of the crackers will clear away the darkness. 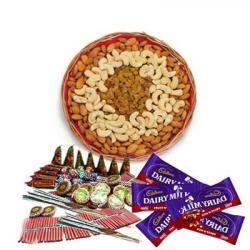 Chocolates and crackers are the two items which are liked by everyone of any age. 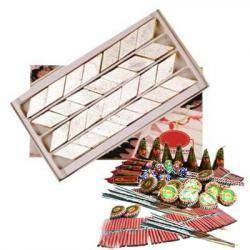 Product Consist : 16 Pcs Ferrero Rocher chocolate Box with Assorted Fire crackers (Worth Rs.300/-) (Note: Types of Fire Cracker are depends upon their availability no specific choice).